Jack Warner threatens to release documents, says he fears for his life, speaks hyperbolically. 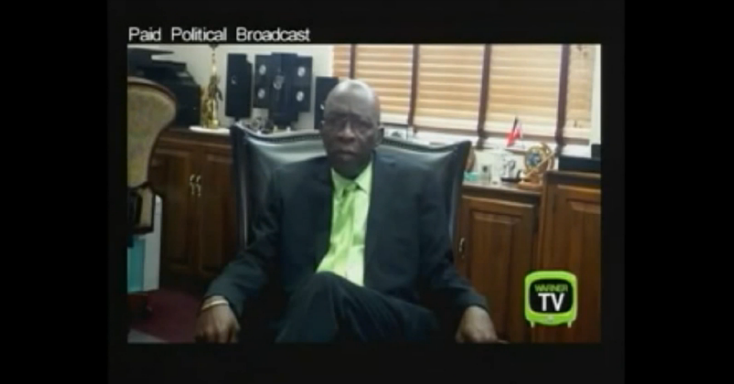 Jack Warner speaks during a paid Wednesday appearance on Trinidad television. Jack Warner—the former top figure in North American soccer and a former FIFA vice president—is wanted for prosecution by U.S. authorities. (He’s the one who cited an Onion article as evidence that the Department of Justice’s soccer investigation was retaliation for the decision not to award the 2022 World Cup to the United States.) Warner has also been on the outs with FIFA since 2011, when he was kicked out of the organization after being accused of corruption by Chuck Blazer. Blazer himself subsequently pleaded guilty to a number of corruption-related crimes, and Warner’s ouster is suspected to have been less about genuine ethics concerns and more about punishment for supporting a rival of FIFA president Sepp Blatter’s. Warner – mopping sweat from his forehead several times – told supporters at the rally that he will not hold back in his plan to expose scandal at FIFA. He said he has compiled reams of documents and is delivering them to his attorneys, for them to disseminate as they see fit. We’ll see, then, I guess. We’ll see whether the avalanche is really coming and whether even death can stop it.